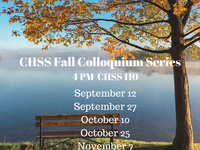 Join the College of Humanities and Social Sciences for a faculty colloquia series. Each presentation will be hosted by a faculty member within CHSS, presentation topics will vary. Faculty, staff and CHSS major/minors welcome! Light snacks will be provided.